Mugwort (Arremisia Vulgaris), smooth-haired, upright, reaching 1 mtr, pungent, growing ground is moist and rich in humus soil, grows wild in the woods and in the fields. 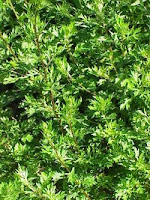 The kind that used to be planted in the garden as a medicinal plant Artemisia argyi levl. et. Vant. This plant grows up to 3,000 mtrs above sea level, comes from China. This plant is a herbaceous half woody, lot of branching, grooved and hairy. The leaves are oval with edges sharing such as fingers, tapered tip, smoothhairy both leaf surfaces. Green leaf color, at the bottom the Colors white, alternate sitting. Flowering compound, small, hump-shaped light yellow color are arranged in a series of shaped panicles that grow down, out and armpit leaves and end stalk. Could be plant propagation by cuttings or seed. Menstrual pain, miscarriage, dysentery, leucorrhoea, difficulty having children, vomiting blood, bleeding, intestinal bleeding, facilitate the childbirth. parts of plants used for medicine: Leaves and whole plant. 1. Excessive menstruation (a lot), menstrual pain (dys menorrhea), menstrual irregularities, prevent miscarriages, excessive fetal movement, dysentery, leucorrhoea. 2. Easing childbirth, difficulty having children. 3. Vomiting of blood (haematemesis), nosebleeds (epistaxis), intestinal bleeding (rectal haemorrhgia). 10-30 grams of boiled leaves, then drink. There are herbs that are made in the form of tablets, injections, oil and aerosol (spray mouth). - Stomach disorders, joint pain (arthralgia), eczema, itching (pruritus), ulcers. Also used as moxa, by heating at the acupuncture points. Artemisia Argyi crushed. Stick it on the wart several times a day, for 30 days. 1 Handheld, artemisia root, 1 thumb ginger, palm sugar 1 thumb plus 4 glasses of water. Boiled until the remaining 2 glasses, drink up. 2 X 1 glass a day. Mugwort and fresh ginger, boiled until thick. Drink 3 times a day. 15-45 grams of seeds, finely ground then eat. 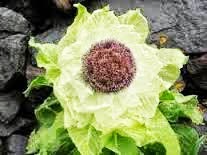 Bitter taste, spicy, warm, Stopping the cold, relieve pain, stop bleeding (hemostatic), promote blood circulation, prevent miscarriage, regulate menstruation. This herb enters the kidney meridian, lung and spleen. alpha-Amyrin, fermenol, dehydromatricaria ester, cineole, terpinen, beta-karyophyllene. Small branches: Oxytocin, Yomogi alcohol, and ridentin.